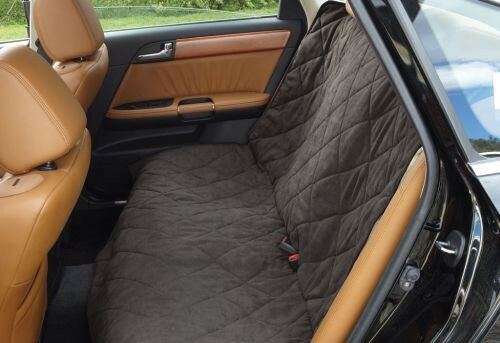 Deluxe Reversible Suede & Sherpa Auto Bench Seat Protector, by Sure Fit, is an innovative, luxurious pet-friendly automobile seat protector that pet lovers and furry friends alike will enjoy while the back bench seat will stay protected from pet hair, stains and wear. It is designed in comfortable faux suede with with box-stitched quilting and lofty 4 oz. filling, reversing to fluffy sherpa for two looks in one. 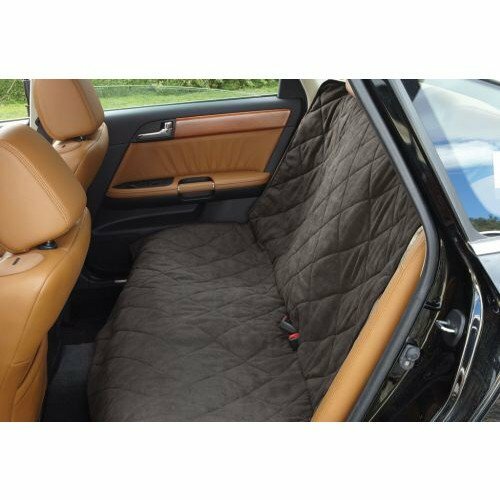 Deluxe Reversible Suede & Sherpa Auto Bench Seat Protector is made from 100% polyester suede with 100% polyester fill and 100% polyester faux sherpa backing. Machine washable. Medium covers fit seats 48 inches to 54 inches wide. Large covers fits seats 58 inches to 64 inches. Innovative Automobile Seat Protector Preserves Seats From Pet Hair, Stains and Wear. Reversible Suede-to-Sherpa Cover Offers Two Looks in One. 100% Polyester Suede with 100% Polyester Fill and 100% Polyester Faux Sherpa Backing. Material: 100% Polyester Fill and 100% Polyester Faux Sherpa Backing. Medium Covers Fit Seats 48 to 54 Inches Wide. Large Covers Fit Seats 58 to 64 Inches Wide.